Do you live with any Transformers fans? Power up for another smashing installment of the new series as TRANSFORMERS: ROBOTS IN DISGUISE – RUMBLE IN THE JUNGLE catapults into orbit on DVD and Digital Download on 23rd May 2016. It is chaos on Earth but will teamwork save the day in this exciting new volume? 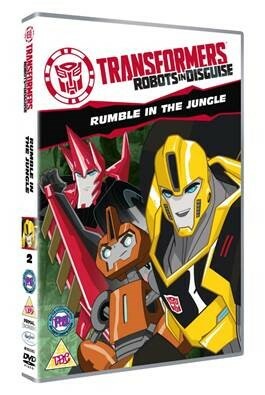 Find out when TRANSFORMERS: ROBOTS IN DISGUISE – RUMBLE IN THE JUNGLE blasts onto DVD and Digital Download on 23rd May. This DVD is super fun and action packed – I have to say I’m quite a fan of Transformers myself, never mind the children, but this will have them on the edge of their seat. My favourite has to be Optimus Prime. BumbleBee is my favourite Transformer. Megatron, cos it’s fun to support the bad guy lol!! Megatron is our favourite as he looks like he means business! Megatron is my favourite and it is also the favourite of my little nephew. It can only be optimus prime cant it? Bumblebee he’s just uber cool! I love Bumblebee, he’s so cool! I’ll be honest, i cant name any of them but my daughter loves them!